Are you craving the style of Kirk Hammett during Metallica’s classic early era? Or just want to have the stage presence of Children of Bodom’s lead axeman Alexi Laiho? While many factors play a part in emulating these two legendary shredders, owning a proper Jackson Rhoads guitar will most certainly help! Today we are looking at a model that mixes both quality and affordability – the JS32, which sits in our chart of the best electric guitars under $300. We took the spikey dude out for a run, so check out the full review below! With the JS32, Jackson makes great use of the iconic Rhoads body shape. The arrow design paired with that blade-like headstock always looks cool when playing on stage (less comfortable while seated, but still workable). This version is made of a relatively cheap but lightweight basswood, with a range of paintjobs from which to choose, including Ivory or Satin Grey. The guitar has a sleek bolt-on maple neck, which has been specially designed with a compound radius for fast playing, whether chording or soloing. It also features a standard rosewood fingerboard with 24 frets and neat shark fin inlays. For the affordable price, it features an excellent build quality and just looks deadly, especially with the addition of all-black hardware. While we did notice some minor fret buzz, we really can’t complain about the craftsmanship, which is stellar when the listed price is taken into consideration. Starting in the electronics department, the JS32 utilizes a set of Jackson-designed high-output humbuckers with ceramic magnets, combined with a three-way toggle switch, and master controls for tone and volume. Nothing particularly special here, but it all works like a charm. This axe also features Jackson’s signature double-locking tremolo bridge, which offers a nifty mixture of stability and freedom, allowing you to thoroughly abuse that whammy bar without affecting tuning stability – further assisted by a set of pretty strong tuners on the headstock. The JS32 makes good use of its relatively basic equipment, with the meaty tone of the stock pickups working well with the drier nature of the basswood body to deliver a sound that delivers for both classic and modern heavy metal. The pickups are pretty powerful and allow the guitar to cut through the mix – as you move from rhythm to lead (which is mandatory with a guitar like this! ), it will stand its ground firmly in a band scenario. While it’s not perfect, it’s great stuff for the listed price! Value for money is one of the stronger points of this guitar and definitely one of the key factors that lands the JS32 on our list of the best guitars for heavy metal. If you want a thick metal sound, killer visuals and a highly-playable neck, you won’t go far wrong. It’s nothing short of a bargain! 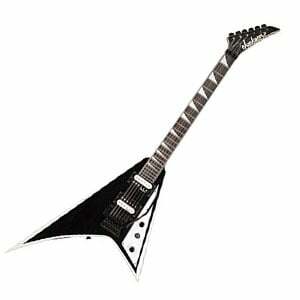 For more info about the Jackson JS32 Rhoads, click here. For more electric guitars under $300, click here.